This section is a collection of articles that are for people who insist on doing wiring on engine swaps and need a little help. Please DO NOT call with questions about this section. We do not have a 1-900 number to accomodate everyones questions. If you have a questions please use the E-mail button or schedule an appointment to bring your project car in and have it wired by us. 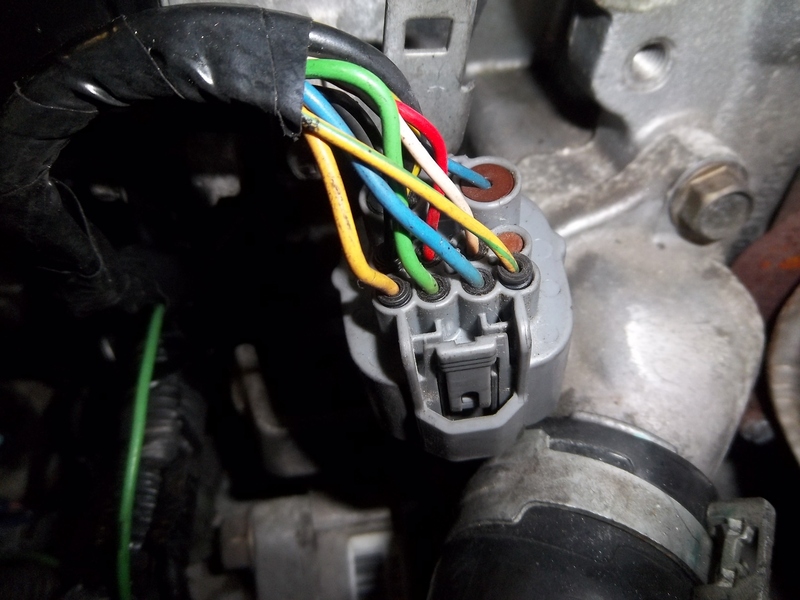 Honda Prelude H22 / H23 / USDM to JDM Distributor wiring. 1. Change to an OBDII Oil Pump, Mount Crank Sensors on JDM engine and use all USDM Timing Gears and Crankshaft pulleys. 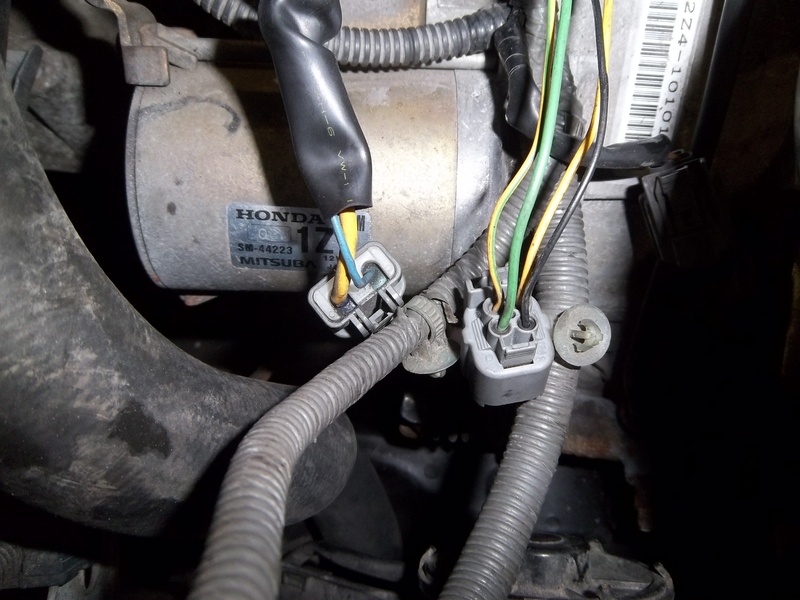 When swapping in a JDM H22 with a distributor that has an internal coil a couple wiring changes must be made to the harness. On US versions of the H22 the TDC and CKP signals are read off the crank in the timing belt casing. In order to rewire these signals into the JDM Distributor follow these steps and it will work without a problem. 2. Cut the plug off and connect the solid Yellow wire to the Black/Yellow wire using solder or crimp connector. Tape this connection good. ( It is the power for the ignition system ) Cut the green wire back and tape off the end. This will not be used. 3. Locate the 2 Distribitor plugs on the USDM engine harness. ( One is 4 pin, other is 2 Pin. ) Cut or De-pin all the wires in the 4 pin connector. Cut the wires that go into the 2 Pin Connector. Cut the green wire back as it will not be used. 4. Locate the FEMALE JDM distributor plug off of the JDM harness you received with the motor set. 5. 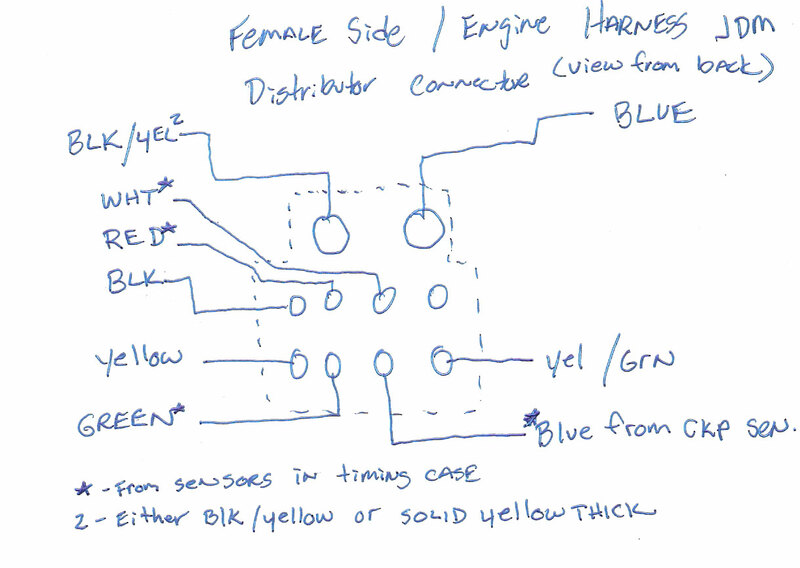 Insert the pins or connect the wires (USDM hanres) for the yel/grn, black and Yellow wire into their coresponding sports on the diagram / picture. 7. Cut the wiring that goes into the timing case on the USDM H22 Engine for the TDC signal and CKP Signal. You should have 4 wires that plug in near the alternator. The 4 wire colors are green, red, blue and white. Extend all of these wires about 12inches so that they will reach over to the JDM distributor plug. Using the same color wire will make this much less confusing. 8. Connect the 4 wires that origionally ran into the timing case for the TDC and CKP signals to the FEMALE JDM Distributor plug as shown in the diagram / picture. (Green, Red, Blue & White Wires) Some of the JDM harnesses will have the exact wire colors already coming out of the plug for this. 9. After everything is wired up the distributor female plug should be from the JDM harness and look like this in the picture. Plug it into the distributor and you are done. ** Please note, the wires coming directly out of the JDM distributor casing will not match the colors of the wirng that is in the pictures below. Picture 2 - JDM Distributor plug wired with all signals wired. When installing a Apexi Power FC D-Jetro into an SR20DET powered car you will need to wire in a IAT ( Intake Air Temp ) sensor into the factory ECU's wiring harness. We are posting this because with a lot of these ECU's being purchased second hand, the manual sometimes does not come with it. The Apexi IAT sensor harness has 2 wires. 1 Red and 1 Brown. Run the BROWN wire into a ground coming from the ECU ( any solid black wire in the ECU loom ) or ground it to the chassis. The RED wire from the IAT sensor should be wired into PIN#26 on the pinout above. In some cases you will need to add a pin to this location. If there is a wire here, cut it and splice your red wire into the ECU. *Be sure you are reading the pinout correctly. Pin#3 should have a Yellow/Red wire coming from it. Pin#16 and #20 should have White Wires coming from it.